EL LIBRO DE MALAQUIAS ES EL ULTIMO LIBRO ESCRITO ANTES DE LOS 400 AÑOS DE SILENCIO ENTRE LOS DOS TESTAMENTOS. MALAQUIAS ES ENVIADO A PREDICAR A UN PUEBLO QUE LUEGO DE 100 AÑOS DE HABER REGRESADO A SU TIERRA HABIA PERDIDO LA MOTIVACION POR SERVIR A DIOS DE TODO CORAZON. EL PUEBLO HABIA CAIDO EN UNA ADORACION DE COSTUMBRE, A SU MANERA, SOLAMENTE PREOCUPADO POR LOS RITOS EXTERNOS Y NO POR LA VERDADERA ADORACION DEL CORAZON. EL SEÑOR MANDA A MALAQUIAS A CONFRONTAR Y A REPRENDER A SU PUEBLO POR SUS ERRORES, PARA QUE SE DIERAN CUENTA QUE LO QUE ESTABAN HACIENDO NO ERA AGRADABLE A DIOS, PARA ACERLOS REACCIONAR Y MOTIVARLOS A UN CAMBIO. PERO ELLOS EN LUGAR DE ACEPTAR SUS ERRORES, EN LUGAR DE SER HUMILDES Y RECONOCER LO MAL QUE ESTABA SU RELACION CON DIOS, FUERON SOBERBIOS, ALTANEROS, Y RETARON AL PROFETA Y A DIOS HACIENDO PREGUNTAS NECIAS, TAL COMO NOSOTROS LO HACEMOS CUANDO SE NOS CONFRONTA CON NUESTROS ERRORES, SIEMPRE DECIMOS: YO?? Y QUE HE HECHO?? Y QUE TIENE DE MALO ESO?? 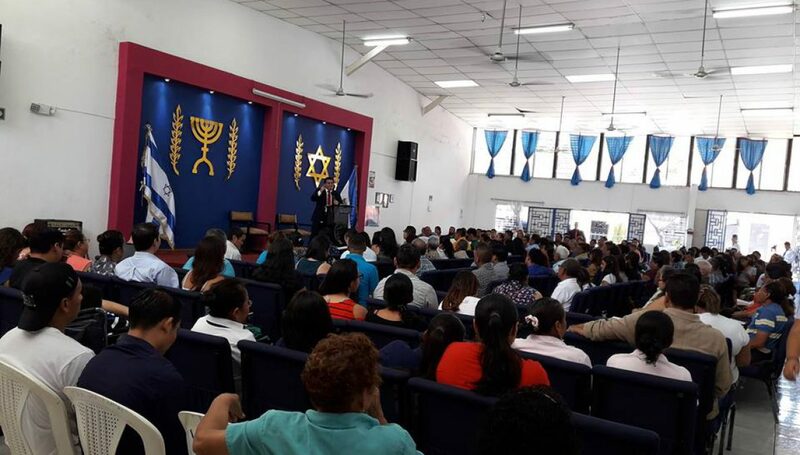 AL IGUAL QUE EL PUEBLO DE ISRAEL MUCHOS QUEREMOS HACERNOS LOS DESENTENDIDOS SOBRE EL PORQUE DE NUESTRA MISERIA, SOBRE EL PORQUE DE NUESTRA FALTA DE PROSPERIDAD, PERO DIOS ESTA MAÑANA NOS DARA LA RESPUESTA. LOS SACERDOTES ESTABAN MENOSPRECIANDO LA MESA DEL SEÑOR, ESTABAN DESPRECIANDO LA MESA DEL SEÑOR. A DIOS LE TRAEMOS EL SUEÑO, EL DESGANO, LA IMPACIENCIA POR SALIR DEL CULTO, PERO EL ES REY, EL SE MERECE LO MEJOR. CUANTO NOS EXTRAÑA QUE A PESAR QUE NO FALLAMOS CULTO, QUE SERVIMOS EN LA IGLESIA, QUE DIEZMAMOS Y OFRENDAMOS, NO SALIMOS DE NUESTRA MISERIA, NO SANAMOS DE NUESTRA ENFERMEDAD, DIOS NO NOS BENDICE. ESTAMOS VIVIENDO ABIERTAMENTE EN ADULTERIO Y NOS EXTRAÑA QUE DIOS NO NOS BENDIGA, Y NOS EXTRAÑA QUE NO HAY PAZ EN NUESTRA VIDA. DIOS NOS RESPONDE NO TE VA BIEN EN LA VIDA PORQUE ERES DESLEAL A LA MUJER DE TU JUVENTUD. NO SERA QUE DIOS NO NOS RESPONDE PORQUE NO QUEREMOS CASARNOS?? PORQUE MENOSPRECIAMOS SU BENDICION?? VOLVERSE A DIOS SIGNIFICA : ARREPENTIMIENTO, DARLE LA VUELTA A MI CAMINO Y VOLVERME A DIOS. COMO NOS PUEDE BENDECIR EL SEÑOR SI CUANDO EL NOS LLAMA A CAMBIAR NUESTRA VIDA, CON SOBERBIA PREGUNTAMOS Y QUE TENGO QUE CAMBIAR?? DE QUE ME TENGO QUE ARREPENTIR?? MUCHAS VECES NO LO EXPRESAMOS CON NUESTRA BOCA, HEMOS MURMURADO EN NUESTRO CORAZON CONTRA DIOS Y POR ESO NOS VA MAL EN LA VIDA, PORQUE NO SE NOS DEBE OLVIDAR QUE DIOS NO SOLO OYE NUESTRAS PALABRAS SINO QUE CONOCE NUESTROS PENSAMIENTOS. PENSAMOS QUE A LOS IMPIOS LES VA MEJOR QUE A LOS CRISTIANOS, PERO DIOS NOS DEMUESTRA QUE ESO NUNCA SERA ASI.